Swedesboro-Woolwich Little Theater - Welcome to SWLT! ​If your child is attending the Kingsway Camp in the afternoon, SWLT staff will walk them to the Middle School at 12:30. 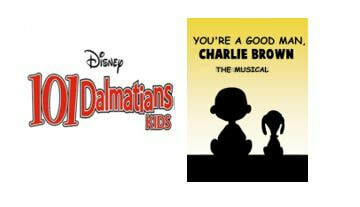 Students will be cast in either 101 Dalmatians or You're a Good Man Charlie Brown after they audition. There is a 10% multiple family member discount. Each camper signed up before April 1st will receive 1 free ticket to our summer season! Sign up for our SWLT Newsletter! Members from SWLT performed as the opening act at the HEADstrong Gala on March 11. We have been featured in the New Town Press!!! Visit our Photo Gallery for more photos of our performances and events! Swedesboro-Woolwich Little Theater admits children and teens of any race, color, national origin, gender choice, and ethnic origin to all the rights, privileges, programs, and activities generally accorded or made available to students in this organization. It does not discriminate on the basis of race, color, national origin, and ethnic origin in administration of its educational policies, admission policies, scholarship and loan programs, and athletic and other school-administered programs.